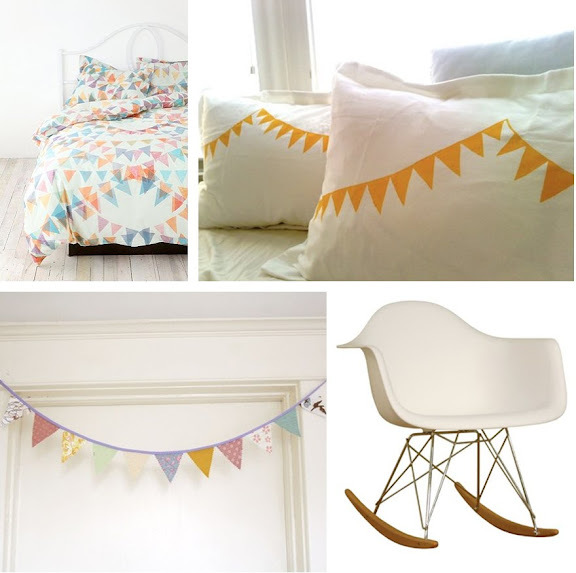 I love the idea of creating a little girl's room based around fabric bunting. I imagine the space would always feel like a party! It would be fun to combine a few of these pieces...they just exude "happy", now don't they? So cute! It just looks like a year round party. I have a small addiction to fabric bunting & quilts. Thanks for pandering to it today! funny, I'm working on a bunting project for my little girl right now!!! I had some old curtains that didn't fit the new house...oila- bunting! I love it! Such a fun and unexpected room design. Love this idea. So pretty and cheerful. Have you guys moved yet? It seems like it's all happening so fast!